This is the fourth volume of Alexandre Dumas' studies of celebrated crimes and their perpetrators. 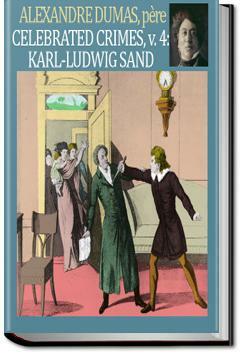 This volume is concerned with the story of Karl Ludwig Sand, who stabbed August von Kotzebue to death in 1819. August von Kotzebue had been a prominent dramatist, a student of Musäus, whose royalist and conservative writings ultimately led to his assassination by a member of a revolutionary liberal Burschenschaft. To już oficjalne- Henryk Pijanowski dołącza do grona moich ulubionych lektorów audiobooków. Podejrzewam, że tak wysoka nota to częściowo jego zasługa.